Description: An indoor/outdoor steel roller coaster that features a hilarious, behind-the-scenes view of life within the enchanted LEGOLAND Castle. Description: This spectacular dark ride invites guests to fire laser blasters at targets and brave the rugged Egyptian landscape in all-terrain roadsters, while attempting to unearth the vast treasures of a forgotten empire. 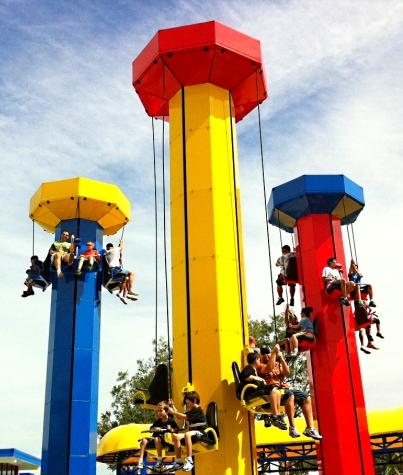 Description: Brave guests feel the power of acceleration, braking and manoeuvrability as they race a life-size LEGO® TECHNICTM vehicle along a wild roller coaster track. Description: A firsthand look at how LEGO bricks are made from factory to finish. 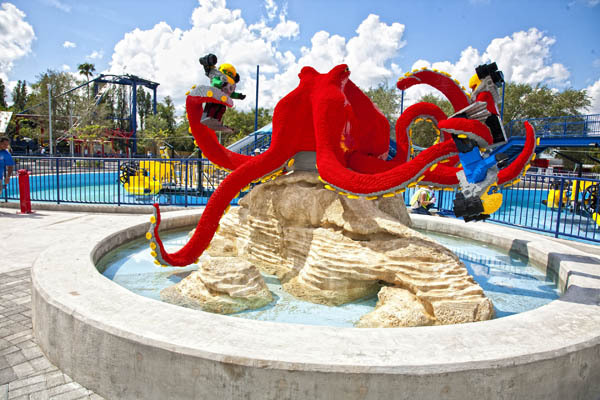 Description: Daytona International Speedway - This area is part of the expanded Florida area, with an interactive Daytona International Speedway® racing experience where guests can race LEGO brick cars. Florida - Florida encompasses the entire state from Mallory Square in Key West to Bok Tower in Central Florida and antebellum mansions in the Panhandle. KennedySpaceCenter - This section gives guests a close up look at the Kennedy Space Center, complete with Shuttle launch, astronaut training and Rocket Garden. Pirate's Shores - This pirate-themed section hosts a full-on swashbuckling pirate adventure as two opposing pirate ships and their “mates” battle it out upon the high seas. California - California features landmarks from Southern California to San Francisco, with Pier 39, the Golden Gate Bridge, Greumann's Chinese Theater and more. New York - New York City features tiny jets of water shooting up from the fountain in Rockefeller Plaza, while an army of animated yellow taxicabs prowls the streets of Times Square. The Statue of Liberty, a cutaway view of Grand Central Station, The Empire State Building, the Guggenheim Museum and the Bronx Zoo are just a few of the iconic landmarks. WashingtonD.C. - Washington, D.C. sports faithful re-creations of the White House (including the first family and “first dog”), the U.S. Capitol building, Smithsonian, Washington and Jefferson monuments and parts of Georgetown. An animated marching band parades in front of the Capitol and tiny cherry trees blossom every spring. Las Vegas - Las Vegas features the world-famous Strip including the Luxor Las Vegas, New York, New York Hotel and Casino, Excalibur, Mirage, Treasure Island, Tropicana, MGM Grand, Venetian, Stratosphere tower and two iconic structures of Paris Las Vegas: the balloon sign and Eiffel Tower. 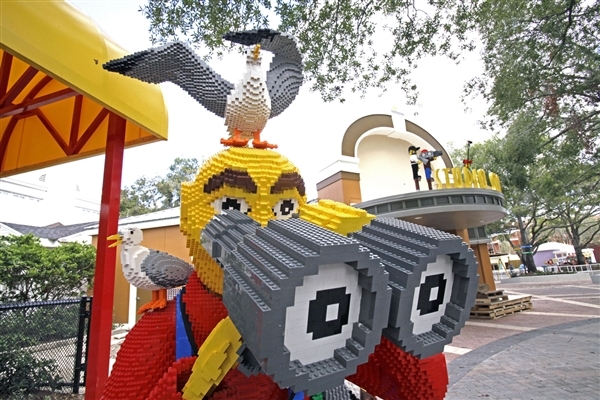 “The Strip” at LEGOLAND also features a miniature wedding chapel, monorails and real-life sounds recorded in Las Vegas. 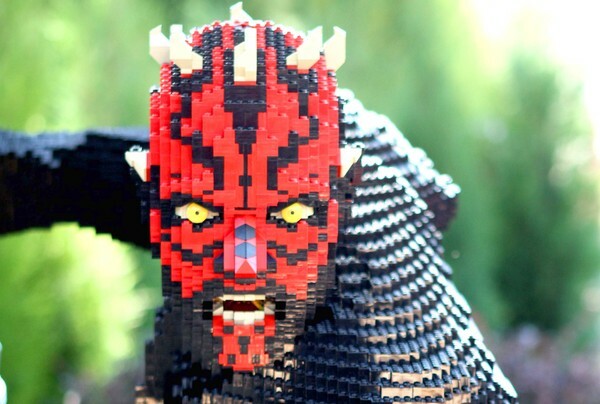 LEGO® STAR WARS™ Miniland - Guests can enjoy seven of the most famous scenes from the six live-action Star Wars movies, as well as a scene from the animated series Star Wars: The Clone Wars™ all made out of 1.5 million LEGO® bricks built in 1:20 scale. 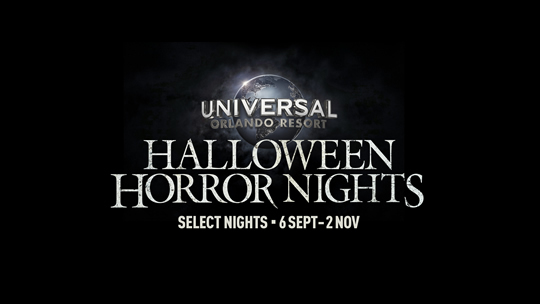 Guests will be further immersed into the Star Wars experience as they pose with life-size LEGO models of Chewbacca, R2-D2 and Darth Vader. Naboo is one of the most geographically varied planets in the Star Wars™ galaxy. This scene depicts the Battle of Naboo and the capital Theed – both the Royal Palace and the hangar can be seen here. In this battle scene, Obi-Wan Kenobi and Qui-Gon Jinn encounter and fight the Sith apprentice, Darth Maul. Look closely at the details of this scene, but not so close that you may be pulled to the dark side! In this scene, visitors have a fantastic view of the Geonosis arena, in which Padmé Amidala, Obi-Wan Kenobi and Anakin Skywalker battle ferocious creatures. Witness the clash between Count Dooku’s droid army and the Grand Army of the Republic. In this scene, two planets are revealed: Kashyyyk and Mustafar. On one side, you'll be placed right into the Battle of Kashyyyk – the home of Chewbacca and the Wookiees. Here you'll discover fantastic vehicles modeled from LEGO bricks, such as the massive Clone Turbo Tank. On the other side, catch a glimpse of the fateful duel on Mustafar between Obi-Wan Kenobi and Anakin Skywalker. Luke Skywalker, Obi-Wan Kenobi, C-3PO and R2-D2 can be spotted in this desert planet...introducing Tatooine. Here you'll discover Uncle Owen’s moisture farm, where Luke Skywalker lived as a child; peek inside the Cantina where the animated Cantina Band plays and stand above the spaceport where the largest LEGO model of Han Solo's famous starship, the Millennium Falcon, sits ready for take-off. The Rebels take refuge on this icy planet, but the Empire tracks them down and the Rebels are forced to flee. Introducing....Hoth. This scene features LEGO models of the Imperial AT-ATs, Rebel snowspeeders and Luke Skywalker’s X-wing starfighter. Look closely and you'll see Luke Skywalker, Han Solo and Princess Leia. Next we travel to a forest moon and home of the Ewoks, who fight against the Imperial Forces alongside the Rebels...Endor. The Endor system plays a key role in Return of the Jedi as the site of the Battle of Endor, fought to prevent construction of the second Death Star. This scene presents the final victory of the Rebel Alliance over the Empire. Here you can view a large-scale model of an Imperial shuttle on its landing platform, delivering a fearsome passenger - the Dark Lord of the Sith himself, Darth Vader. The seventh area brings us to a scene from the animated series The Clone Wars on the planet Christophsis. Chronologically, the series takes place between Episode II and Episode III and focuses on the adventures of Jedi Knights Anakin Skywalker and Obi-Wan Kenobi. The LEGO scene depicts part of the planet’s surface, with the largest of all LEGO Star Wars™ models: an approximately 8-foot tall building from the Crystal City. You will also a scene showing a battle between Separatist battle droids and Republic clone troopers. Description: This interactive show uses acrobatics, music and playful fun to teach fire safety as the zany crew of Fun Town Fire Department attempts to conquer the “Big Test” to become official firefighters. Description: Market Restaurant offers great variety for the entire family all day. Start your morning out right with a nice cup of brewed coffee, specialty coffee drinks and freshly baked breakfast pastries. Lunch and dinner options include rotisserie chicken, Asian Fusion, fresh salads and great kid-friendly options. You can also get your sweet fix with delicious bakery items and a milkshake from the “Create A Shake” station. Description: Visit our BBQ Pit for a unique twist on a southern classic! Barbecue Pulled Pork is layered on pita bread and topped with coleslaw, making it a delicious treat. Make it a meal with chips and a drink! Description: Ahoy Matey! Dine on one of our freshly made cheeseburgers or fried chicken sandwiches with golden French fries. For our smaller pirates, we offer a kids burger meal complete with milk or water and a side of fruit! 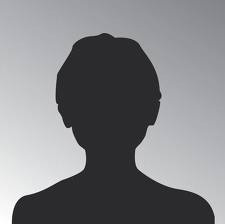 Guest Services: In The Beginning, you will find Guest Services, where our friendly Model Citizens (LEGOLAND employees) are standing by to answer questions and offer assistance. Stroller/Wheel Chair Rental: We do what it takes to make your day as easy as possible. 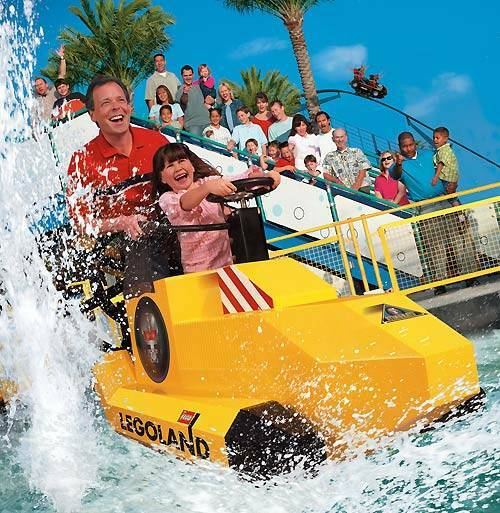 Strollers, wheelchairs, lockers and all the necessities to help you make the most of your LEGOLAND Florida visit. *Inventory available on a first come, first served basis. Cost: Stroller pricing is $10 for single-seat stroller and $15 for double-seat stroller. Wheelchairs are $12 and ECVs are $37 for the day. Lockers: Lockers are available for rent on a first come, first served basis in The Beginning, immediately to your left after entering the park. Package pick-up: Available for purchases made at any of the retail locations inside the park. Make your purchases at any one of our retail locations and then pick them up at the Package Pick-up area in The Beginning near the Locker and Stroller rental. Please allow two hours between purchase and pick-up. Baby Care Centre: The Baby Care Center, presented by Winter Haven Hospital, provides a nursing and changing area, bottle warming and more! Located inside the Duplo Farm. 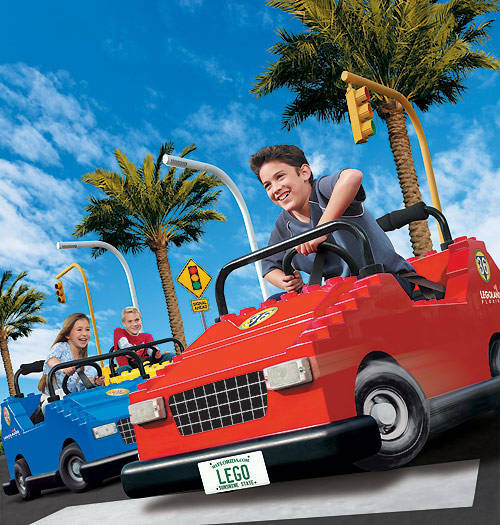 LEGOLAND Shuttle: LEGOLAND Florida offers daily shuttle service from the Orlando Premium Outlets on operating days. Times: Pick up time is 9:00 am, please arrive 30 minutes prior to departure. Leaves to return at Park closing. Review : The live water ski show is spectacular. Make sure you see it! Review : My 5yr old’s 1st ever rollercoaster, he LOVED it ? ?